Graber commercial quality aluminum curtain and drapery track system can handle up to five pounds per foot of drapery weight. Good for heavy use installation such as hospitals, hotels, office buildings and residential where you expect top performance. You can buy components and make your own custom installation or have it made by the experts. Replacement parts are available for continued use in hotel and other large maintenance departments. Some profiles can be bent or curved for bay and bow windows. 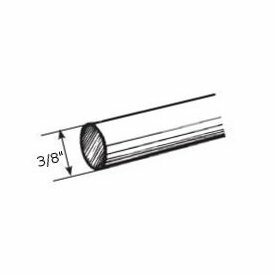 Graber Super heavy duty one-way right traverse rod 66-120"
0-6619-1: Graber Super heavy duty one-way right traverse rod 30-48"
0-6629-1: Graber Super heavy duty one-way right traverse rod 48-84"
0-663-1: Graber Super heavy duty one-way right traverse rod 66-120"
All the parts to repair or replace existing Kirsch Architrac Track systems. New installations or old, we have the parts you need. Custom assembled system also available. Wood pole bracket for 1 3/8" rod. Matches Wood Trends Classics collection in colors. Goosneck bracket for a finished look. Brass finish. This model has a 1 inch clearance. Use with 3/8" diameter rods, 7002-12-063 or 7003-12-063. Priced by the pair. For rod cut size, deduct 2-1/4 inches from outside bracket mount position. Minimum order 12 foot increments. White finished anodized aluminum. Baton draw, ceiling mount flange for easy installation is perforated every 16 inches. For pinch pleat, ripplefold and grommeted systems. Also available in 14 and 16 foot lengths.